A black and white negative of Ralph McCarl and Ralph Brown standing outside and posing with their arms on each other’s shoulders. Both boys are dressed in suits. Parked cars are visible behind them. 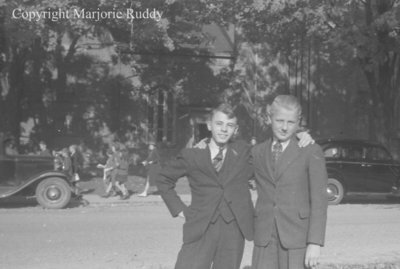 Ralph McCarl and Ralph Brown, c.1938, Marjorie Ruddy. Whitby Archives A2013_040_865D.